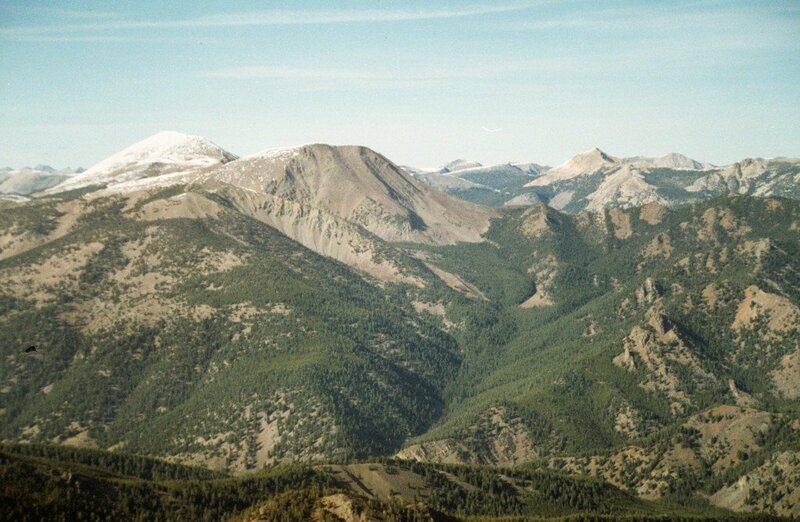 The Lemhi Range is covered in the book on pages 295 to 318. All Lemhi Range peaks covered on this website can be found at this link: Lemhi Range Updates. The Lemhi Range is a quintessential linear mountain chain that runs from Salmon in a southeasterly direction for 100 miles to the Snake River Plain. It varies in width from 10 to 15 miles. The Pahsimeroi and Little Lost River Valleys border the range on its western side, and the Lemhi and Birch Creek Valleys parallel its eastern side. The range was named Lemhi in 1917 (Lemhi is a corruption of Limhi from the Book of Mormon). Signs of Native American habitation dating from 8,000 years ago can be found along the base of the range, but their name for the range is lost in time. 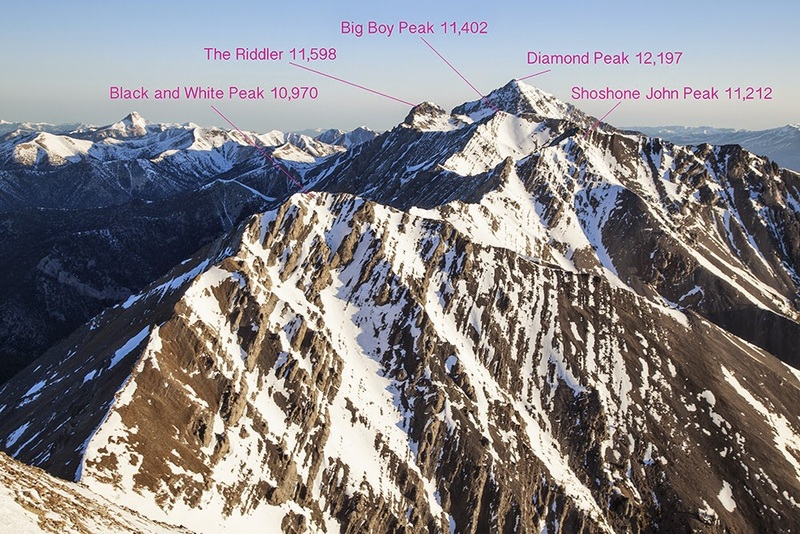 The range has 118 peaks rising above ten thousand feet: one 12er, nine 11ers and 108 10ers. 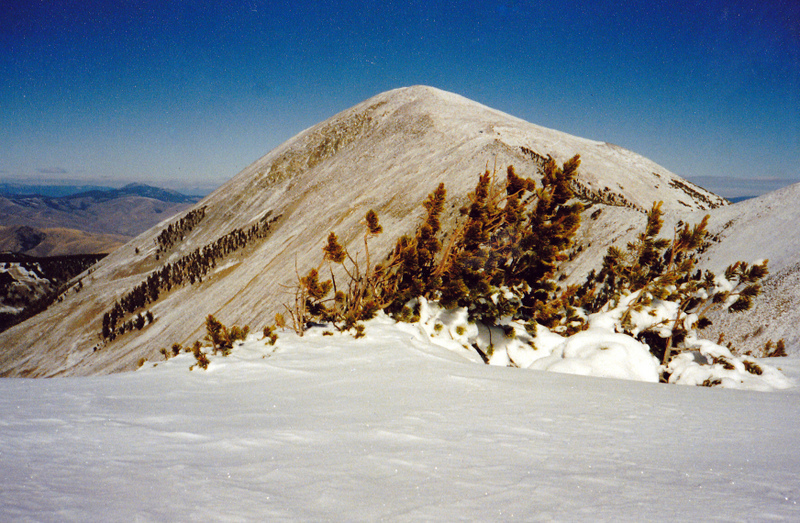 Diamond Peak is the highest summit at 12,197 feet. The Lemhis are a basin and range fault block composed of limestone, quartzite, and related sedimentary deposits. Glaciation along the crest has carved the rock at will. While many peaks are nothing more than incredible piles of talus, others are solid blocks that present impressive faces to the valleys below. The range’s crest consistently rises more than 4,000 feet above the broad alluvial valleys that flank it, staying above 10,000 feet in elevation. The range is broadest in the north with high peaks, remote valleys, and dozens of mountain lakes. 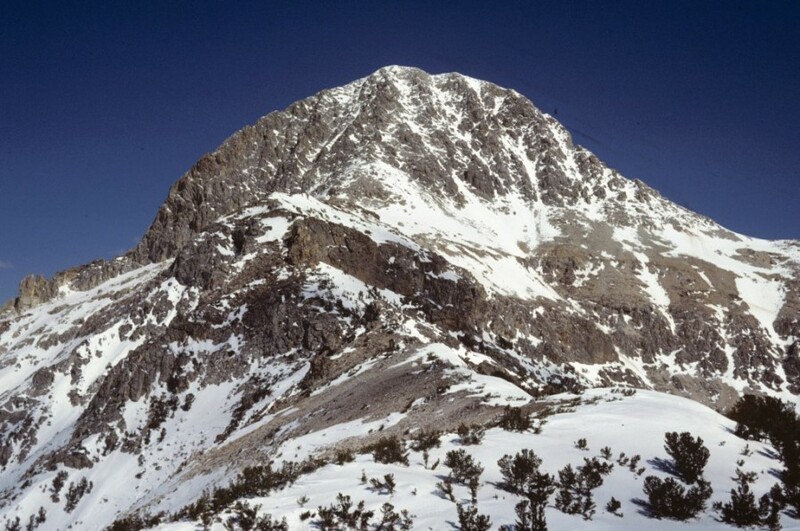 The central Lemhis, which are narrower, steeper, drier, and higher than the northern peaks, include the range’s most impressive peaks: 12,197-foot Diamond Peak and 11,618-foot Bell Mountain. The southern end of the Lemhi Range, south of Saddle Mountain, is a semi-desert region characterized by deep canyons and massive cliffs. The two most impressive of these canyons are Box and East Canyons. Box Canyon is a winding canyon that shelters several important archeological sites and some impressive cliffs. East Canyon, north of Box Canyon, is most noted for its tremendous limestone cliffs, the largest of which is capped by a large natural bridge. Both canyons were used extensively by prehistoric inhabitants; more than eighteen archeological sites have been identified in and around the canyons. 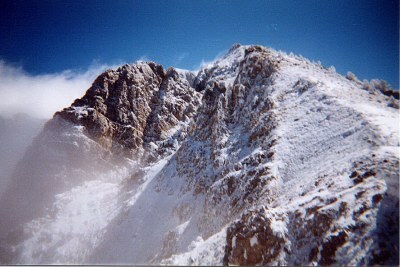 Lemhi Peaks. The view east from Iron Creek Point includes Big Creek (left skyline) and Flat Iron Peak to its right. There are not many places like the Lemhi Range left. Its fragile alpine life zone grows more than two hundred types of plants. Some, such as the Arctic poppy, face extinction. The windswept land above 10,000 feet is home to maybe four hundred of Idaho’s best climbers, Oreamnos americanus, the mountain goat. Even as late as 1998, a few of its peaks have yet to be climbed. It is a special place. The foothills and lower slopes of the Lemhi Range are administered in the north by the BLM. Two national forests share the backbone of the range. The Salmon-Challis National Forest manages the entire northernmost 25 miles and the western side of the crest south to the Snake River Plain; the Targhee National Forest administers the southern half of the Lemhis east of the crest. There are many archeological sites in the range. 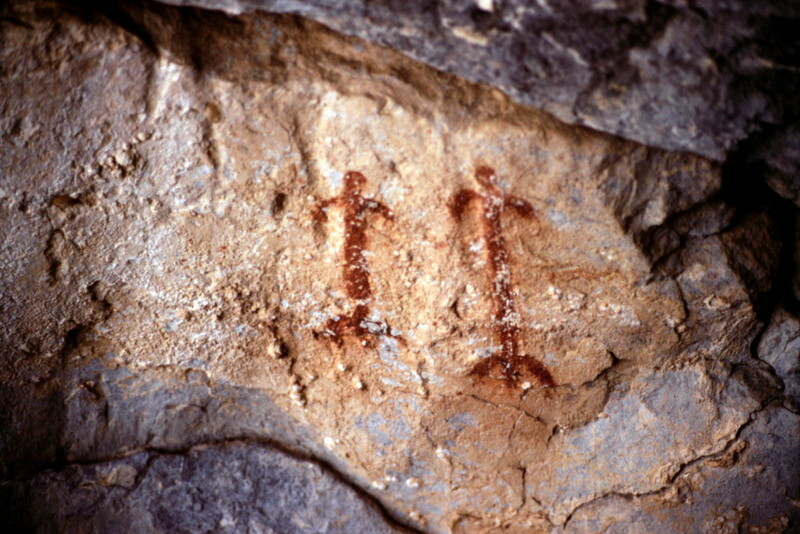 These petroglyphs are found in Box Canyon. Hiking opportunities abound in the northern part of the range where an extensive trail system offers excellent backpacking opportunities. The southern part of the range has few trails, but is suitable for rugged cross-country travel. Recreational use of the range is limited, because few Lemhi Range trailheads are accessible without a 4WD. 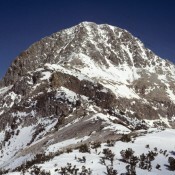 The west face of Bell Mountain. Climbing opportunities within the range generally fall within the Class 2 to 4 categories, with most of the routes rated Class 3. The broken condition of the rock limits technical climbing. Winter mountaineering involves long approaches up to the base of the mountains. While snowfall is not excessive on the alluvial fans, the wind blows the snow into drifts that prevent vehicle access and leave much of the ground bare and unsuitable for skiing. Only a few winter ascents have been recorded, although others have undoubtedly occurred. There has been a significant amount of mining in the range and you will find the remnants of this activity in many spots. 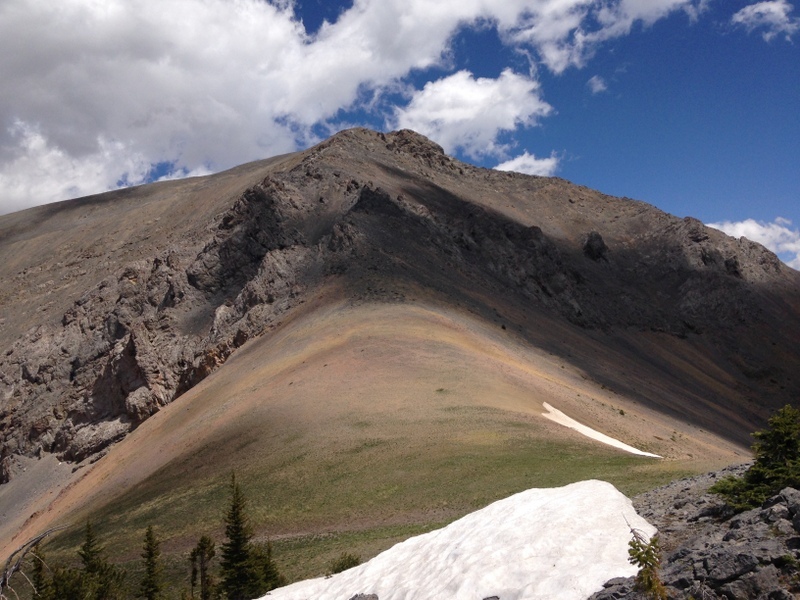 Check out Ray Brooks‘ article on peaks and mining in the area of Big Windy Peak which was published in Idaho Magazine. The final saddle before the summit is at 9,800 feet.